"Democracy thrives when it is open-faced," Ms Alliot-Marie told the National Assembly when she presented the bill last week. She stressed the bill, which makes no reference to Islam or veils, was not aimed at "stigmatising or singling out a religion". Berengere Poletti, an MP from Mr Sarkozy's centre-right UMP party, said women in full veils wore "a sign of alienation on their faces" and had to be "liberated". Andre Gerin of the Communist opposition compared the veil to "a walking coffin, a muzzle". The bill is also seen as a touchstone for the Sarkozy administration's policy of integration. It is grappling with disaffected immigrant communities as it seeks to prevent a repeat of the mass unrest of 2005 on run-down French housing estates. But critics point to government studies showing that many women do not fit the stereotype of marginalised, oppressed women. There are estimated to be only about 2,000 women wearing the full veil in France though the bill is opposed by many of France's five million Muslims. 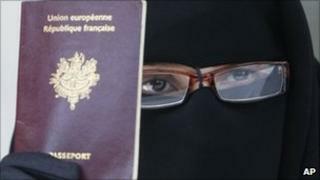 Mohammed Moussaoui, the head of the French Council of the Muslim Faith, a government advisory body, has supported taking steps to discourage women from wearing the full veil but has said a legal ban would stigmatise a vulnerable group. Jean Glavany, a Socialist MP, said he opposed the ban on the grounds that it was "nothing more than the fear of those who are different, who come from abroad, who aren't like us, who don't share our values". The Council of State, France's highest administrative body, warned in March that the law could be found unconstitutional. If the bill passes the Senate in September, it will be sent immediately to France's Constitutional Council watchdog for a ruling. In another development, a French businessman, Rachid Nekkaz, said he would set up a 1m-euro fund to help women pay fines imposed under the new law. A ban in the street would violate constitutional principles, he argued.